Back then and still today, I work every day to develop and help companies to implement practical solutions for “optimal profit.” Here’s what I have discovered. Industry benchmarks and averages are interesting but irrelevant to great leaders. Great leaders lead with a crystal clear vision of what their “great” looks like. They do not operate to get to the industry average. They lead and operate everyday with determined persistence to discover and achieve their optimal best and to reset optimal best constantly in their relentless pursuit of great. And, their relentless pursuit is internal; it’s nearly spiritual – just because they have to prove it – especially to themselves. Over the years I have found that a clear vision and a bias for action are the two vital leadership attributes that truly inspire and mobilize people. Separately, these qualities are limited and ineffective, but combined they create a powerful toolset for organizational engagement and progress. As Mayor of New York City, Rudy Giuliani understood this when he painted the picture for all New Yorkers and the world that “we are going to make this the safest city in the world.” Many New Yorkers wondered if that was really possible. Still, that BIG vision of the future was one that people desperately needed to believe because it offered them hope and clarity. Giuliani operated with a clear and definite bias for action and implemented visibly practical plans designed to move NYC towards his greater vision. And, he was relentless. Paraphrasing Tom Peters, Giuliani was not about “too much talk and too little do.” Giuliani was all about great talk and great communication and a whole lot of do. His words, actions, inspirational vision, and realistic approach united the people in a common cause or purpose. Great Leaders think boldly, act confidently and communicate relentlessly. It all starts with a bold, fresh vision of the future. Great leaders self-motivated and self-inspired by their dreams and vision of the future, but it is also what motivates or inspires all of us. We all want to know that we are working toward something consequential, something special or important. It gives us something to want to be a part of. This simple truth applies to every single person within your organization. That is why the real job of a true leader — to offer a vision of the future that inspires, thrills and compels people to want to be a part of. As a strategic advisor to executives, I always start my Re-envision discussions with the question: how can things be better? And then, how can things be great? It’s more interesting, and fruitful, to start with optimism and then to move quickly on to how to execute against that aspiration. I also find that it doesn’t matter much if I am working with a big or small company president. 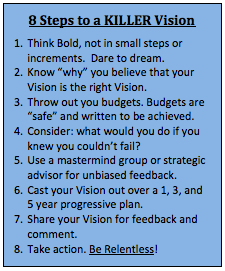 Getting them to cast a big, bold and inspiring Vision is a difficult, multi-step process. Most people tend to be “incrementalists,” thinking in little steps rather bold, bright future thoughts of the ideal. It’s an exciting adventure. Of course, aspirational and inspirational vision achievement sometimes falls short of the ideal. Then, leaders aspire forward being flexible to change and adjust and continue their pursuit. Changing and adapting your vision is okay. Not having a vision is not okay. my 30+ years in retail, I have had the good fortune to work for many great leaders. Among them, one quality or trait is [to me] irrefutable. Every great leader I have met or studied has had a clear Vision of what their better tomorrow looks like and a passionate desire to share and achieve that vision. They are always forward thinkers. They never feared making mistakes in pursuit of great results. And they were consistently intolerant of lazy people or people who talked but didn’t perform. A bold, bright, ideal vision can lift people up and engage them. Great leaders use bold, bright visions to inspire people to rise-up to big challenges and great accomplishments.